Splitting your time between homes in Los Angeles, New York and London seems a far cry from Kiltoom, near Athlone, Co Westmeath, where Martin Nolan grew up the middle child of seven, where he went to Ballybay national school going “up to the teacher for more ink for his pen” and was reared by his mother following the untimely death of his father. 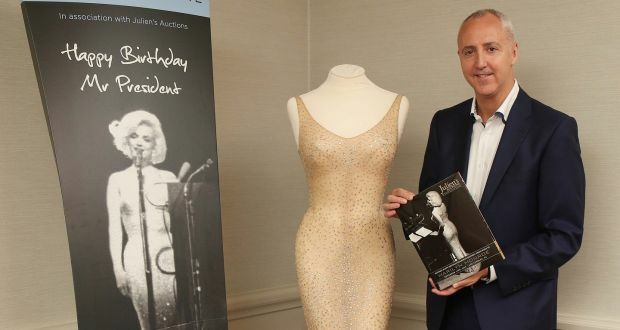 When we meet in Dublin’s Westbury Hotel, the co-owner, chief financial officer and executive director of Julien’s Auctions – the “auction house to the stars” – in Los Angeles and former Wall Street stockbroker has just wheeled in the dress Marilyn Monroe wore when she sang Happy Birthday to then US president John F Kennedy, en route to the Newbridge Silverware Museum of Style Icons. As regards security it’s a delicate and time-sensitive operation (the dress later sold for a record-breaking $4.8 million to Ripley’s Believe It Or Not) and yet Nolan is generous with his time and his conversation sparkles as much as the dress. He recalls a “very ordinary life” outside Athlone where he attended the local primary school. His father, who worked for the ESB, died when Nolan’s youngest sibling was just four years old and he says this had an impact on the careers of the children when they grew up. At the same time, he realised that he’d have to be “his own rainmaker”. He was ambitious and his mother encouraged him to travel. He studied at the College of Commerce in Rathmines at night and trained in accountancy, later going to work in Australia for a year. In 1989, Nolan won a US immigration green card in the lottery and moved to New York. He got a job as a bellman at the Hilton Hotel, working his way up to bell captain and doorman. In 1992, he made the decision to stay in New York and train as a stockbroker, working 12-hour days on Wall Street, earning $5 an hour. He worked Friday, Saturday and Sunday nights at the Hilton. A chance meeting with Darren Julien, founder of the then new company Julien’s Auctions, would change the course of his career and lead him away from that notion of a “steady job”. When Nolan joined, there were just five people in Julien’s Auctions . There are now 20 full-time employees and numerous others employed as experts in certain fields. The company has handled collections from people such as Marilyn Monroe, John Lennon, Ringo Starr, Michael Jackson, Elvis Presley and Frank Sinatra, with record-breaking sales of items such as Starr’s Ludwig drum kit, which sold for $2.1 million. While his current role seems a million miles away from Wall Street, Nolan says it is essentially still about commodity selling and buying. But “instead of doing it on an exchange, it’s in an auction room”. As a commissioned employee on Wall Street, he hadn’t really had a salaried job since 1992 and therefore the instability of the business wasn’t an issue for him. “When I joined Julien’s it was a case of building up the company, so I’ve always had to make it happen. We’ve now got 20 employees who have to be paid, mortgages and rents have to be paid,” he says. Nolan was keen to introduce a charity element to Julien’s when he got involved in the business. Nolan had been running marathons and doing other charitable work for years. When the opportunity arose with Julien’s, he realised he could do something to help others by offering live auctioneering services for charity events, by donating entry fees for auctions to charity and by encouraging clients to donate a proportion of their proceeds to charity. Travel and engaging with the media have become significant aspects of Nolan’s job and he travels frequently to Ireland, London, South America, Japan and China (where he says people revere the belongings of stars such as Jackson). He also makes frequent appearances on shows such as NBC’s Today and on BBC news. He believes his Irishness has positively influenced his career in the US. “Even when I was a bellman at the Hilton, I always got a bigger tip – people just seemed to love the Irish,” he says. “As an employer, the expectation always was that you were going to be a good worker and trustworthy. It was better than any PhD or master’s degree.